Everyone loves New Bike Day. In this case, for me it was an old bike I already had, that was recently remade into a 3-speed, and it might be the zippiest 3-speed there is. I got the Geoffrey Butler frame back in 2009 from a classified ad on what was then the Serotta Bike Forum, since re-christened the Paceline Forum. The frame was in great condition and the bike brand is named for a semi-obscure British racer turned bike shop owner. Geoffrey Butler opened a shop in the 1960s in South Croydon, England which is still there today. He was the younger brother of Claud Butler, a better known British shop owner with their own branded bikes. 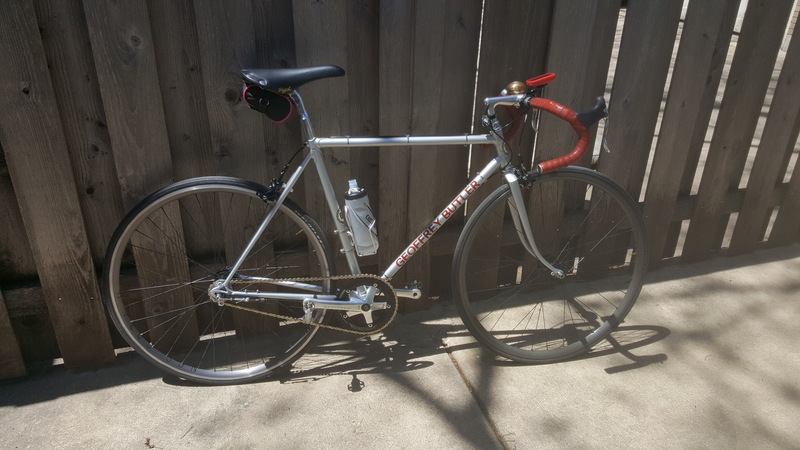 The frame I bought was a mid-to-late 70s model made with Reynolds 531 tubing and long Campy dropouts with all the cable stops intact, but no bosses or braze-ons for shifters or bottle holders. The lugs are particularly gorgeous, especially at the junction of the seat stays, top tube and seat tube. I researched what I could of the frame and even contacted the shop about finding out more about the exact year or other details, but was unable to gather much. I was told they get these requests from time to time, but don’t have any information on the old shop frames unfortunately. Geoffrey Butler contracted with several British frame builders who did the custom frames for G.B. and it seems rather unlikely I will ever be able to discover much more about it. When the frame arrived, it was in relatively good shape with a bit of age showing on the paint and some surface rust in various spots. Every purchase or sale I have ever made on that forum has been easy and hassle-free. I first built the frame up as a traditional 70s road bike with a combination of Nuovo Record, Cinelli, 3T, Mavic, Brooks and miscellaneous parts. The lack of shifter bosses and the configuration of the cable routing was a bit of a bummer and the friction shifting and mismatched parts proved clunky and in the end I decided to convert it to a fixed gear for road bike. I had an old Shimano 105 crank, a no-name stem and seat post and a slightly dented set of Nitto drop bars anodized red to play off the logo. I built up a set of wheels with Formula Hubs and Sun M13ii rims with a Dura Ace 16t cog, an old Campy Record front brake and kept the Brooks seat, adding some red leather Brooks handlebar tape to top it off. This was my daily rider for the next couple of years, replacing the much abused Sekine I had been using steadily for some time. Fast-forward a few years, and I decided to get Duane Waller from Chester Cycles to repaint the bike and recreate the down tube logo, leaving the badge logo on the head tube and seat tube intact. (I never did replace that Reynolds 531 sticker!) He did an amazing job and the frame looked like I had picked it up in South Croydon fresh from making. My buddy Michael Abene and I rebuilt the bike with mostly Miche parts and wheels. Nice as it turned out, to be honest, it didn’t really see much use at that point, as by then I had gotten my first modern bicycle, a carbon 2013 Ridley Fenix which I ride/rode just about all the time. I had a few other bikes that I would use for other types of riding, but even just doing the tours, I almost always rode the Ridley. Modernity is a spoiler for sure. Last year, Michael had turned his Specialized Langster track bike into a 3-speed with the aid of the fine folks at Turin, who built him a Sturmey Archer fixed-gear hub with a White Industries freewheel (better shifting under load than the S.A. freewheel hub) laced to H Plus Son rims and a bar-end shifter. When he sold the Langster, I bought the wheels and shifter from him. I won’t lie…I know my way around bikes pretty well, but I am in no-way a fan of bar-end shifters and was stymied by what else to use with drop bars, as normal 3-speed shifters can’t get around the bends. I also plead the Fifth when it comes to internal geared hubs and never really liked working on 3-speeds. Turin had rigged an interesting method of shifting the internal hub by connecting the cable through the rear brake mount and down the seat stay to the hub, which could have worked, but still didn’t solve the shifter problem for a man that disavows the bar-end shifter. Then earlier this spring, my friend Ben Fietz opened a new bike shop in Albany Park with his buddy Steven Blum. I called him up and chatted about the project and then took it to over to their shop, Tailwind Cycles to brainstorm. I wanted to keep the rest of the build the same and convert the fixed wheels to the new wheel set with some solution for shifting. Initially I proposed using the front-derailleur shifter of a touring integrated-shifter (touring bikes have 3 front chain rings and the left shifter operates the front derailleur), but the cable pull length was all wrong. He proposed using Gevenalle (Retroshift) and the guts of a Sturmey Archer shifter, but the direction of their shifting mechanism was backwards. Then we looked at using a Paul Components Thumbie with the SA shifter, but Paul told him he didn’t think it would work. It looked like I might be stuck with the stupid bar-end shifter, but he proposed using a standard SA shifter on the quill stem. I found a picture of this and sent it to him and he said that was exactly what he had in mind. Bingo. He also reconfigured the routing to follow the down tube and under the chain stay like a traditional 3-speed. It turned out quite nice and I still have space up front for my Crane bell (every commuter needs a bell), a light and my Garmin mount. I did the shake-down ride today, and I am convinced that this is the world’s best, fastest, and certainly most stylish 3-speed in existence. And if I am wrong, I don’t even want to know. So once again, I have my nice daily rider and a good bike for the Chicago Neighborhood Bike Tours. It might be nearly as old as I am, and I missed taking its maiden voyage on my birthday by a couple of days, but all the same, I love New Old Bike Day. Hopefully you can join me on Saturday for the Tour of Logan Square to see it in person. This entry was posted in Chicago Velo Blog and tagged New Bike Day on May 8, 2017 by Lee Diamond.